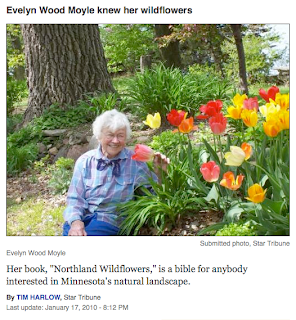 Evelyn Wood Moyle, who collaborated with her husband in the 1970s on the publication of the very popular Northland Wildflowers, passed away this month in St. Louis Park, Minnesota. She was 95 years old. Those who worked with her over the years, including University of Minnesota Press associate director Beverly Kaemmer and senior acquisitions editor Todd Orjala, considered her to be a real gem and a wonderful person to work with. The book, for which Moyle did the photography, has sold more than 50,000 copies in its various editions over the years. The Star Tribune has compiled a very nice tribute to Moyle, who was very active within and dedicated to her local community. Moyle also contributed an essay to Minnesota's Our Neck of the Woods (2009). Just what exactly is "eco-fashion," anyway?